Leading first-crop sire Hes Relentless has booked full in 2019. NORMAN, OK—APRIL 9, 2019—Hes Relentless, the AQHA Racing champion 3-year-old colt of 2014 and current leading first-crop sire this year, already has a full book for 2019 at a fee of $3,500. Bob Moore Farms, who stands the son of leading sire One Famous Eagle at their farm in Norman, Oklahoma, says they are accepting mares for a waiting list for 2020. From limited starters in the first 40 days of 2-year-old racing, Hes Relentless has sired 3 winners, 1 stakes winner, earners of $255,050 with average earnings per starter of more than $21,250. "Bob Moore Farms would like to thank the ownership of Hes Relentless for allowing us to be part of the team these past three years," general manager Phillip Stewart said on Tuesday. "It has turned out to be a great start for this young stallion. 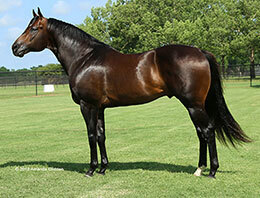 I don’t remember any other stallion starting his career like Relentless has. It is early in the year but it has been awesome to this point," he added. Hes Relentless got off to a quick start this season at the racetrack, siring the winner of the 2019 Grade 2 $396,650 Oklahoma Futurity March 23 at Remington Park. Ec Revenge drew off impressively to defeat Pepper Ryan by one-length. A $25,000 Heritage Place Yearling Sale graduate, under jockey James Flores, stopped the clock in :15.307 seconds, a 93 speed index for the 300 yards. Bred by William E. Smith, from the Corona Cartel mare SS Pamilla, Ec Revenge has compiled a 2-for-2 record and banked $164,490. This past weekend at Remington Park a daughter of Hes Relentless, Relentless Jessie qualified for the $895,210 Remington Park Oklahoma-Bred Futurity(RG1), to be run back on April 20. Racing for owner Manuel Francisco Mata and trainer Luz Chavira, Relentless Jessie entered the trials off a very impressive maiden win in her career debut at Remington Park March 17. Bob Moore Farms, LLC bred the sorrel filly from the Gold Medal Jess mare Jess A Queen. She was a $3,500 bargain for Mata at the 2018 Heritage Place Fall Mixed Sale. Hes Relentless is also the sire two additional 2-year-olds who posted times in the top 20 starters from two days of Remington Park Oklahoma-Bred Futurity(RG1) trials and 22 trial races. Shes Relentlesswagon and Relentless Gun are preferred invites to the $100,000-Guaranteed Oklahoma Juvenile Invitational to be run April 20. On Sunday (April 7) Hes Relentless got the fastest qualifier for the $25,000-added John Deere Juvenile Challenge at Turf Paradise. Determined Cowboy, under jockey Martin Osuna, completed the 350 yards in :18.396 seconds into a 7 mph headwind to garner the top qualifying spot. It was the first career start for the gelding, owned-and-trained by Armando Castellanos, from the Western Challenge (TB) mare Shes Western. Jon Mixer and Dan Ward is the breeder. The John Deere Turf Paradise Juvenile Challenge final will contested on April 28. For additional information to request to have a mare added to the 2020 Hes Relentless waiting list contact Stewart at 405-329-8571.